Clean style and comfortable function invite you to take a load off. 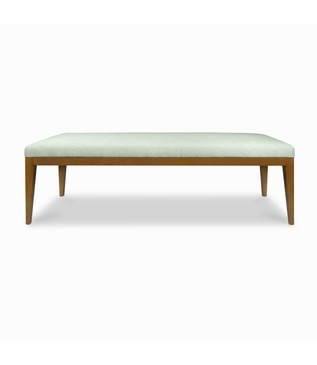 Shown upholstered in a textured faux leather, the Gifford Bench boasts a frame finished in Honey with a semi-gloss sheen. As with all pieces from our Custom Furniture Collection, this handsome bench is made-to-order in Los Angeles and can be infinitely customized. Choose your own fabric, dimensions, and base. Also available in customer’s own material (COM). For pricing, please call, e-mail, or submit an online quote request. Dimensions: 56" • D: 18" • H: 19"